Tuition and $20 registration fee are due at time of sign-up. We will contact you within 48 business hours for payment information. If you start in the middle of the month, your lessons will be pro-rated. We require a credit card be left on file in our auto debit system. To sign up for music lessons, please fill out the form for each student (1 form per student.) If you prefer a paper form, click here. Questions, concerns, etc. can be addressed by calling us at (815) 623-1000, filling out our standard contact form or sending us a message on our Facebook page. Payment information is due upon registration. We will contact you within 48 business hours to confirm payment information, balance due and to finalize your lesson appointment time. Appointment times are not final until we have contacted you via phone call to confirm. Due to past issues, our policy now indicates that a student's spot will not be reserved in our lesson schedule until a credit/debit card is on file in our auto debit system. Instant text alerts regarding emergency closings, special events and more. I fully understand that Piano Tunes Music Academy, Inc.’s staff members are not physicians or medical practitioners of any kind. With the above in mind, I hereby authorize the PTMA staff to render first aid to student in the event of any injury or illness, and if deemed necessary by PTMA staff to call a doctor and to seek medical help, including transportation by PTMA staff member or representatives, whether paid or volunteer, to any health care facility or hospital, or the calling of an ambulance for said student should the PTMA staff deem this to be necessary. Do you approve of internal and external use of photos/videos for PTMA’s promotional purposes such as print advertisements, website, newspaper articles, newsletters and social media. What is your ideal lesson start date? We are open Monday - Saturday, 1pm - 7pm. (Closed on Saturdays June - August) Lesson dates and times are not final until they have been confirmed by our office staff via phone call. By filling out this form, you authorize Piano Tunes Music Academy, Inc. to keep your card information on file. You will not be charged until we contact you to confirm the form receipt. By checking this box, you authorize Piano Tunes Music Academy, Inc. to automatically run monthly tuition on the 28th of every month for the following month’s tuition costs. (i.e. the payment will run April 28th to pay for May’s upcoming lessons.) If payment is not received by the 5th of the month, students will be automatically removed from our lesson schedule and a $10 reinstatement fee will be due in order to resume lessons. 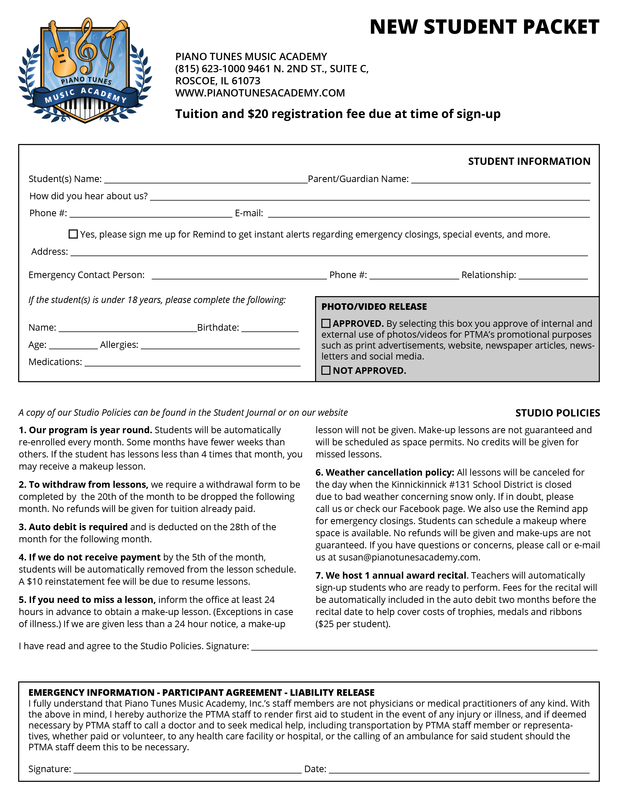 To withdraw from lessons, please fill out our withdrawal form before the 20th of the month to avoid being held responsible for the following month's tuition. Thank you! We will contact you within 48 business hours to confirm payment amount and final lesson time. A paper copy of our studio policies can be found in our student journal. Our program is year round. Students will be automatically re-enrolled every month. Some months have fewer weeks than others. If the student has lessons less than 4 times that month, you may receive a makeup lesson. To withdraw from lessons, we require a withdrawal form to be completed by the 20th of the month to be dropped the following month. No refunds will be given for tuition already paid. Auto debit is required and is deducted on the 28th of the month for the following month. If we do not receive payment by the 5th of the month, students will be automatically removed from the lesson schedule. A $10 reinstatement fee will be due to resume lessons. If you need to miss a lesson, inform the office at least 24 hours in advance to obtain a make-up lesson. (Exceptions in case of illness.) If we are given less than a 24 hour notice, a make-up lesson will not be given. Make-up lessons are not guaranteed and will be scheduled as space permits. No credits will be given for missed lessons. Weather cancellation policy: All lessons will be canceled for the day when the Kinnickinnick #131 School District is closed due to bad weather concerning snow only. If in doubt, please call us or check our Facebook page. We also use the Remind app for emergency closings. Students can schedule a makeup where space is available. No refunds will be given and make-ups are not guaranteed. If you have questions or concerns, please contact us. We host 1 annual award recital. Teachers will automatically sign-up students who are ready to perform. Fees for the recital will be automatically included in the auto debit two months before the recital date to help cover costs of trophies, medals and ribbons ($25 per student). If you need to cancel, please fill out our withdrawal form.